The August Carnival of Children's Literature is up over at Sandy Fussell's Stories Are Light blog. Writing for children knows no borders, of course, but I'm trying to recall if there's been another Carnival hosted from Australia or anywhere else that to me is overseas (cuz, like, to Sandy I'd be overseas!). Anyone remember one? Regardless, there are some fabulous links at the Carnival, and I hope you'll head on over and check it out. I dunno. It amuses me. It amuses me, I tell ya! "Cut them quickly," she said speedily. "I want them gone," he said needily. "Show don't tell," he said directly. "Use them well," she said correctly. "I hate adverbs," he said whinily. "We're all done," she said finally. It's a little silliness either designed to end your summer or to send you back to school, I type optionally. Regardless, I hope you enjoy! The Poetry Friday roundup is over at Teach Poetry K-12 today. Why not go check it out? Over at my other blog, The Happy Accident, I put up a tutorial about Facebook's privacy settings in light of their rollout of Places - their geo-tagging equivalent of Foursquare or Gowalla. Since I figure most everyone who reads GottaBook is either on Facebook or familiar with it, I wanted to share the link and take a moment to note that taking care of your privacy settings is really rather important. Even though I always assume that everything I do online will be public in the end, I do take whatever steps I can take to make that less likely! I had a lovely little real-world vacation... and while I was gone, I missed being a part of a few interesting conversations. But that doesn't mean I can't link to 'em or talk about 'em later! Over at MotherReader's blog, she writes about the new Lane Smith book, It's a Book. There's some controversy... and interesting comments, too. And at a slew of blogs, there's talk of Ellen Hopkins being disinvited to the TeenLitFest in Humble, TX. A few other authors have now bowed out of the event. I liked Pete Hautman's post on the topic - The Nasty Thing in the Corner - in which you'll find links to many other posts and good conversation in the comments. Yes, I'm late to this, I know, but it's still worth a shout-out or two. While I was all SCBWI-ing, Betsy Bird was talking about whether there should be an ALA poetry award or not. Check out the heavy hitters talking in the comments there! Then last Friday, Elaine Magliaro reposted something of her own on the same topic from 2006 that's well worth a read, too. Guess what? I'm in the camp that's pro-award. Shocking, isn't it! 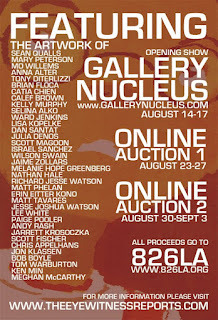 A Charity Auction... With Cool Art! Dan Santat - author, illustrator, trailer-maker-extraordinaire - has put together an auction to benefit 826LA, a fab organization that brings the arts to school kids. And this particular auction will be happening online and gives you a chance to nab some artwork by a slew of amazing artists working in the children's book field. You know, folks like Sean Qualls and Mo Willems and and and and, well, see the picture below. 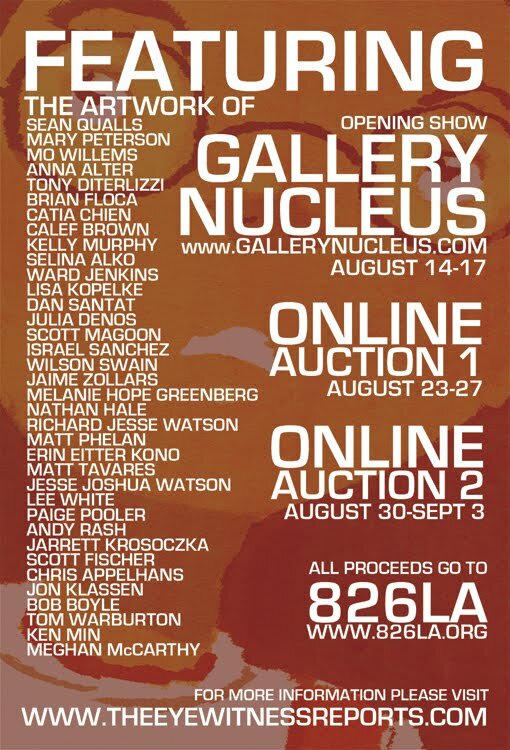 If you click the link, you'll see a trailer and more information about how you can get involved (as in... buy the art!). Check it out! Over at the Happy Accident, I wrote up more about Rubin Pfeffer's keynote as well as my own thoughts on this whole future of publishing debate. The comments are rocking, too, so be sure to check them out. The Poetry Friday roundup is over at Author Amok today. Give yourself a little moment of poetic fun and go check it out. I have probably said this after every single SCBWI summer conference I've attended, but I'll say it again: what a blast! This was my first year on faculty - a huge honor and thrill, I must say - but that didn't change my experience very much at all, other than meaning I had to prepare and miss a few sessions when I was talking. I'll have a post up at The Happy Accident recapping what Alice Pope and I talked about in our sessions, by the way. Soon. Soooooon. Highlights, as usual, are too numerous to list in detail... though here are a few of mine. I was excited by what Jon Scieszka is doing with his new series Spaceheadz. The story and the multi-faceted online components work together even as either stands on its own. But they combine to enrich the universe of the story AND offer more fun for the reader. Check out http://www.sphdz.com to get a taste. M. T. Anderson's breakout session on experimental fiction included a great reading and analysis of One Fish, Two Fish, Red Fish, Blue Fish, including comparing it to Burrough's Naked Lunch! Earlier, he sang us a Delaware state anthem that had 1,000 people roaring. But I digress. Ruben Pfeffer delivered a clear-eyed view of the fact that, well, the future is now so to speak - ebooks are here, technology does have an impact, the business is changing and will continue to... and really, it's not a bad thing. This was the clearest, most direct, non-blinders-on view of the industry I've heard, and I applaud Ruben for delivering it and the SCBWI for asking him to do so. Denial is our biggest enemy, seems to me. Seeing 87 year-old Ashley Bryan on stage, getting 1,000 of us chanting poetry with him, filling us with inspiration, and reminding us of the importance of words on a page and getting young readers to connect with them was an experience that will inspire me for years to come. There are a ton of great roundups already appearing on blogs today, and I'm sure more will come during the week. The SCBWI Conference blog has write-ups on all of this and more and is really worth a trip whether you were there or not. Finally... it was great to see so many familiar faces there... some only familiar from Twitter and blogs, but many from knowing you now for years. It was a great time, and I'm already looking forward to next year!